CCTV Dome Camera (eSSL-EB4-48/EB4-70)- There are many model of CCTV Dome Camera for security system. This model is one of the best model ofCCTV Cameras. This camera has 1/3″ Sony Super HAD (charge coupled device) Chip. The CCD chip plays a major role in making a fantastic and reliable picture. This camera has the greatest CCD Chip which makes a reliable and very clear picture of the object or any person in front of this camera.There is a 12 MM F 1.0 cs Lens which can take a very clear picture.This model can visualize the picture/scene upto 50 mtr. area. It means it can visualize the objects or any person moving in 50 mtr. area from the place where this camera is installed. 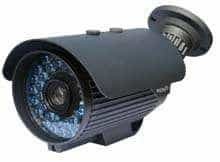 We are the best CCTV dealer in Delhi, Faridabad, Rohtak, Haryana, India Noida.